You can improve user-engagement and conversion on your small business site by making better use of the site header. It’s the first place people look on the site and what they find there sets the tone for the rest of their visit. Get visitors engaged: Your header is the first thing people see. Clear branding, direction or call-to-action at the start of the visit makes them more likely to use your form or browse your products. Reduce bounce rate: A good header gives visitors assurance that they are in the right place even before the page has fully-loaded. Make big improvements with small risks: Most website templates put your header in a separate file from the rest of the site. Everything you need to touch is likely inside one div and a couple of CSS classes. Try different ideas and experiments without endangering the rest of your site. To sum up: Improving your small business site header is a modular project with a lot of potential and minimal risk to other areas of your site. Take a look around the web and notice what sites are putting in their headers: you’ll see a lot of logos, but you’ll also see publishers starting off with advertising banners, while ecommerce companies offer site search or a promotion. Login links and personalization are also common. None of this is random. You can learn a lot about a site’s priorities by looking at their site header. Boston.com is the web-oriented little brother of BostonGlobe.com. It’s entire reason for existing is to increase online revenue. In contrast, the Wall Street Journal limits access and focuses on serving it’s core audience of people interested in finance. Their different approaches are reflected in what they put at the top of their sites. Both Macys.com and Nordstrom.com want you in their database before you leave the site. Both are offering their visitors alternative reasons to sign-up other than an immediate purchase. I’m building my business around me. When you land on the site, you immediately learn my name and what I do. Clear branding is a good starting point for any header changes, especially if your visitors come through un-branded channels. To the right of my brand name are links to my social profiles. Social media is a key part of my life and my business. Connecting with me on Linkedin, Twitter or Google+ lets you learn more about me and lets me keep communicating with you. The links also serve as trust marks: I’m putting my online identity out there for you to see and assess — the implication is that I’m totally fine with you learning more about me. BTW: those links are tracked as Events in Google Analytics, so I can see how often they are used. This is the 1st version of my header and I know that it will change. But right now, I know that the space is not being wasted and that it adds value for me and visitors. That’s the most important thing and that’s what you should keep in mind when you are thinking about your header. Point them toward a goal: For example, add a banner linking visitors to your “request a free quote” form. Help them find your store: If you do business from a physical location, then make sure your address is easy to find. Share big news: Did you launch a new product? Or, land a big client? Have a link to the announcement. 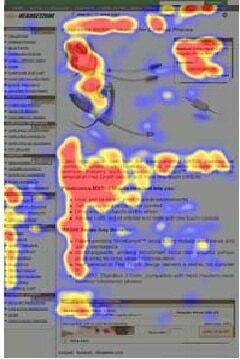 Instantly Gratify: Like WSJ.com, give your visitors immediate access to what they want most. Give them a gift: Share a whitepaper or simple advice. This is my first post in a series about increasing traffic, engagement and conversions on small business sites. In the series, we’ll look at improving sites by leveraging your existing assets as much as possible. Small, targeted changes to your existing site can have a large impact. I’m starting at the top of your site and working my way down. Next week, I’ll talk about adjusting and customizing top-navigation. Please drop questions or suggestions into the comments. I want this series to help you as much as possible, so I need your feedback.